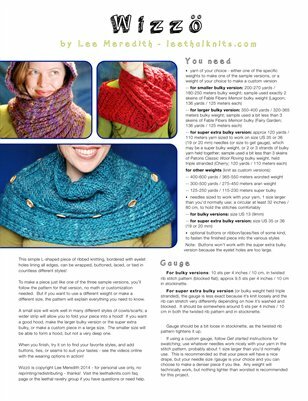 This is a knitting pattern for a convertible cowl/scarf/hood accessory. This simple L-shaped piece of ribbed knitting, bordered with eyelet holes lining all edges, can be wrapped, buttoned, laced, or tied in countless different styles! The knitting in this pattern is extremely simple and beginner friendly! A small size will work well in many different styles of cowls/scarfs; a wider strip will allow you to fold your piece into a hood! Add buttons, ties, or seams to suit your style preferences. See the Wizzö page on leethalknits.com or on ravelry.com for photos and more details about the pattern, and videos of all the ways it can be worn.